The Armoured Battle Groups of the République of France make good use of their deadly Heat Lance weaponry to burn through the enemy. Danton Land Ships and L’Arman Heavy Tanks both utilise this powerful technology to reduce their targets to ruin. 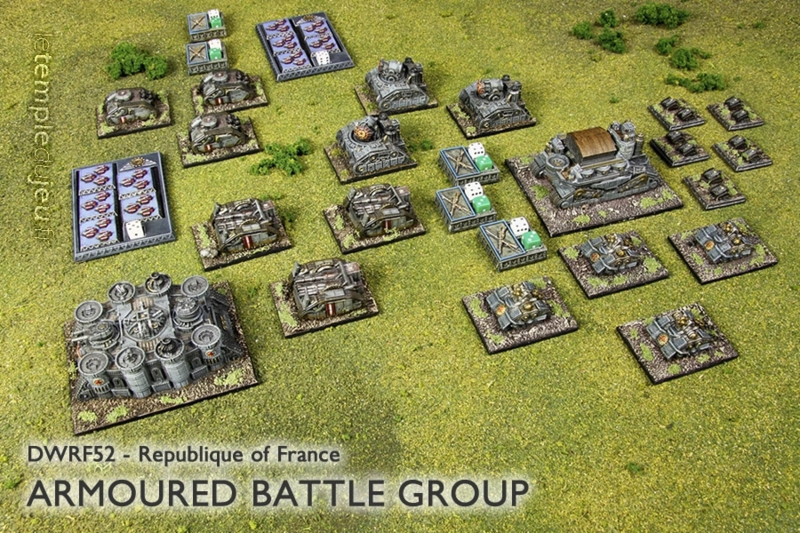 Meanwhile, Foucalt Medium Tanks supported by Reims Light Tanks and Hotch Small Tanks strike deep into enemy lines, whilst the Marteau Bombards and ... <lire la suite>. The Armoured Battle Groups of the République of France make good use of their deadly Heat Lance weaponry to burn through the enemy. Danton Land Ships and L’Arman Heavy Tanks both utilise this powerful technology to reduce their targets to ruin. Meanwhile, Foucalt Medium Tanks supported by Reims Light Tanks and Hotch Small Tanks strike deep into enemy lines, whilst the Marteau Bombards and Alsace Land Ships work with local aerial assets to hammer the most stubborn of foes into submission.